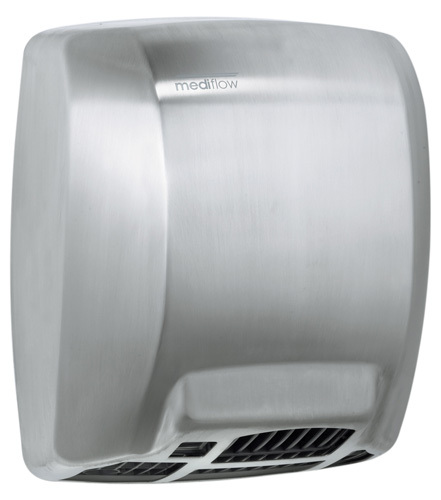 Mediflow® Stainless Satin Sensor Operated hand dryer is characterised by its power and ruggedness. Automatically operated compact solutions, which thanks to its two product options, are better suited for any type of washroom environment. It is proven long lasting and completely reliable. The quietest dryer in its class. Extreme vandal proofing. Cover fixed to the base by means of 2 vandal-proof lock screws and lock with special Mediflow® wrench. Fire resistant plastic UL 94-V0 base and fan scroll, with 4 Ø 8 mm holes for wall mounting. Universal brush motor, 4500 rpm, F class, incorporates a self-resetting safety thermal cut-off at 120 ºC. Fe, Al & Cr taped wire heating element mounted on a mica frame that incorporates a self-resetting safety thermal cut-off at 110 ºC. Automatic disconnection 1/2 second before motor stops. Logic Dry technology: Automatic regulation of air temperature based on ambient temperature. Selective detection of fixed targets and automatic disconnection after 120 seconds of continuous use. Fully adjustable (5 - 20 cm) IR electronic detection sensor. Adjustment is by means of a potentiometer.